3.1.1.1. Please make sure you keep your web server in a dry place, away from water and humidity. If you are unable to do this, please purchase our DRI box. Or follow the link to our commercial catalogue and take a look at our nodes which are more suited to outside conditions. Take your slide out of the packaging and SOAK YOUR SLIDE for 24 hours for freshwater tanks and 48 hours for salt water tanks. Please Note: Do not put your slide in tap or RO water, use a cup of your tank/pond water. 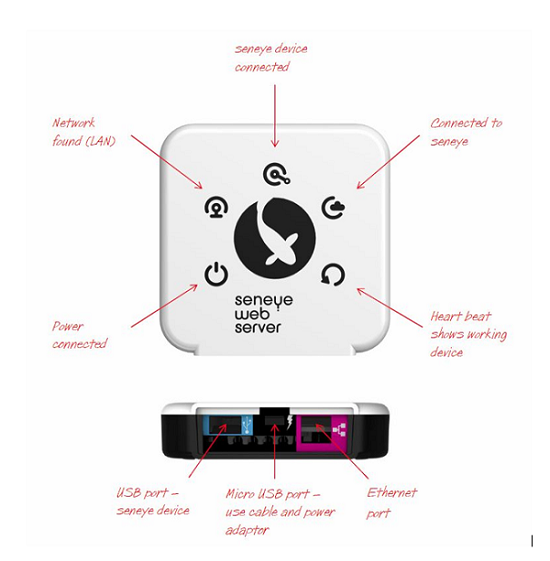 If you intend to use a seneye USB connected directly via USB to a PC please use these instructions. If you are a new user please register an account at www.seneye.me. You will need to use the E-mail address that you want your alerts sent to. Once you have registered, please ignore any details on the Welcome E-mail that mention downloading the seneye connect application. Once your registration is complete, please continue through these instructions. If you are using any products such as BT Parental Controls or SKY shield or other internet security services then the SWS may not be able to communicate with the seneye servers. Please click here for more information. 2. 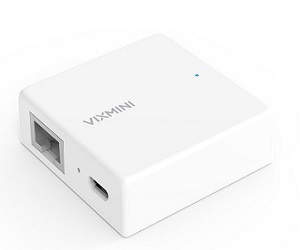 Then connect the other end of the cable directly to your router. 2. Connect one end of the micro USB cable (supplied) into USB power adaptor. 3. Connect the other end into the micro USB port (black port) of the SWS. If the lights flash in a circular sequence on the SWS after powering it up, it is downloading a firmware update. Please leave everything connected until the lights are in the state shown below. Open a web browser on a device that is on the same area network as your router. Find your SWS ID on the label on the front of the SWS. If you don't have this label anymore then it can be found by unclipping the back cover of the SWS. This is what your SWS GUI will look like, don't forget to bookmark it so you can access it easily! Connect your seneye USB device (SUD) directly to the SWS. 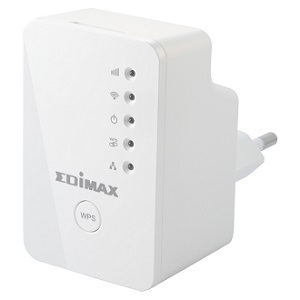 You must connect the SUD directly to the SWS and not use any form of extension leads as the SUD will not communicate correctly. If the SWS has detected that the firmware is out of date, it will put the SUD in boot load mode, and the SUD tile on the GUI will tell you to keep your device connected. Do not disconnect your SUD from the SWS until the tile shows the image below and the LEDs on the front of the SWS are still circling. Once the tile above is shown and the lights have stopped circling, disconnect the SUD from the SWS and reconnect it to complete the update. Please make sure you keep your web server in a dry place, away from water and humidity. If you are unable to do this, please purchase our DRI box. Or follow the link to our commercial catalogue and take a look at our nodes which are more suited to outside conditions. 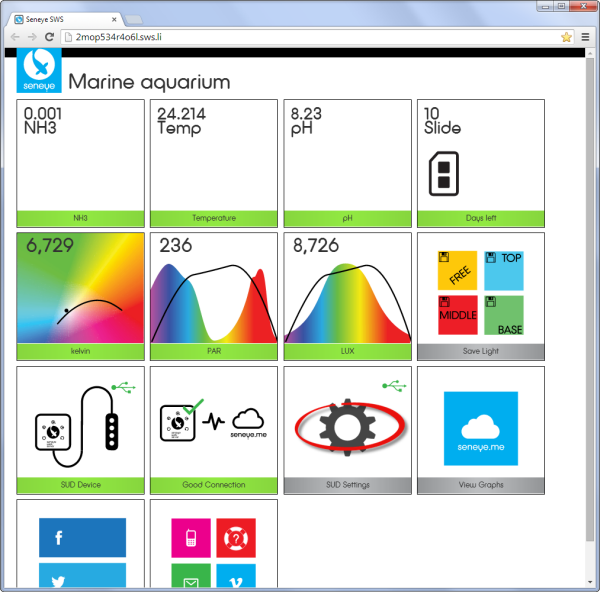 If you are using your sensor in saltwater you will need to check the Marine Tick box for your sensor so that it can adjust pH readings accordingly. If you are using your sensor in freshwater you do not need to make this adjustment and can skip ahead to Stage 7. 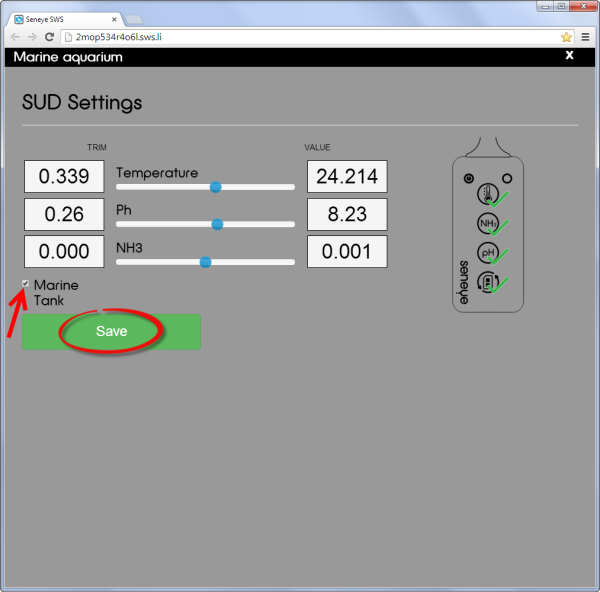 Once your sensor has been connected to your Seneye Web Server, and the firmware has been updated if it needs to be, you can check the Marine Tick box using the Seneye Web Server's GUI. 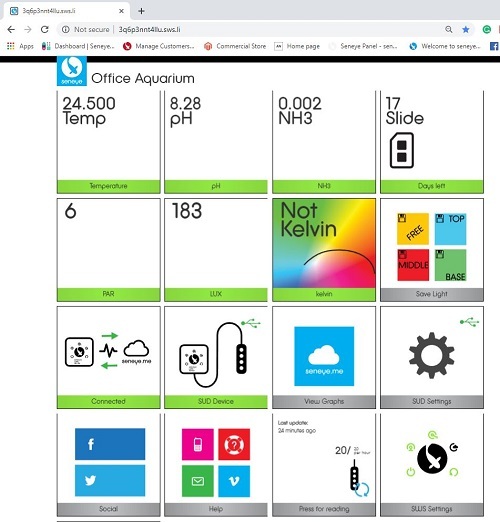 You can always uncheck the Marine Tick box at a later stage if you want to use your sensor in freshwater instead of saltwater. If your SWS came with a WiFi adaptor module, you will need to set it this up. 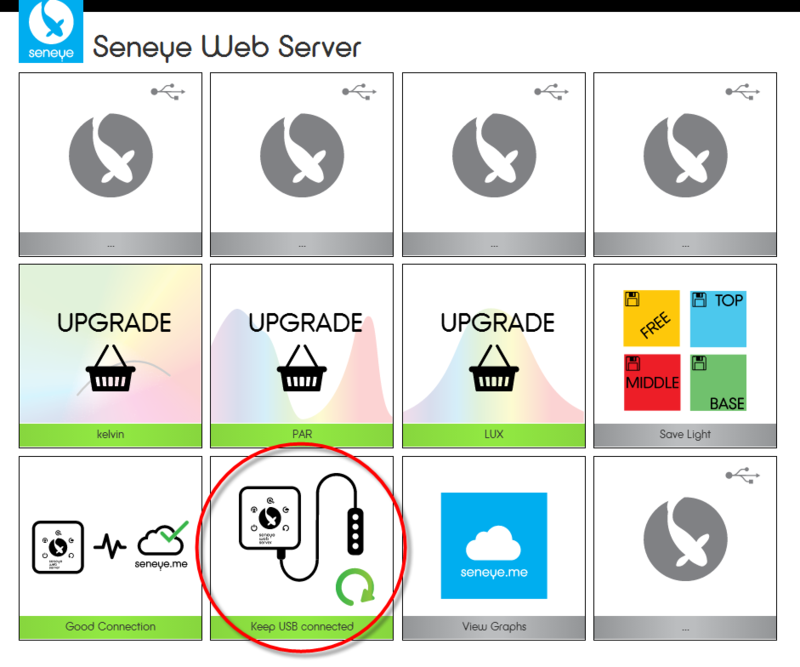 You may also find the following links useful to get the most from your new seneye device.